In case you missed it, tickets for Countdown NYE 2018 went on sale last Friday. The New Years Eve festival from Insomniac will take place Monday, December 31st at the NOS Events Center in San Bernardino, two days after Audiotistic Southern California 2018 takes place at the same venue. New stages with an alien inspired theme are in store for the 2018 edition of the event, including The Mothership, The Nebula, Area 51, and Twilight Zone. 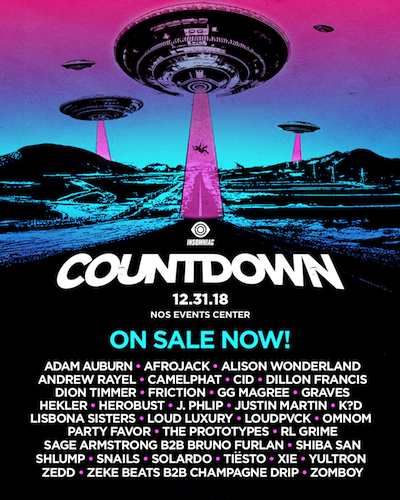 The lineup for Countdown NYE 2018 includes the likes of Afrojack, Alison Wonderland, Andrew Rayel, Camelphat, Dillon Francis, Dion Timmer, GRAVES, HEKLER, Herobust, Justin Martin, and k?d. Also scheduled to perform are OMNOM, Party Favor, The Prototypes, RL Grime, Shiba San, Shlump, Snails, Solardo, Tiesto, Yulton, Zedd, and Zomboy. General admission tickets for the 18+ show are $133.99 total, with the festival running from 5pm-2am. VIP tickets are currently at $221.99 total. Combo tickets for both Countdown NYE 2018 and Audiotistic Southern California 2018 (taking place on Saturday, December 29th) are also available for $179.98 total.